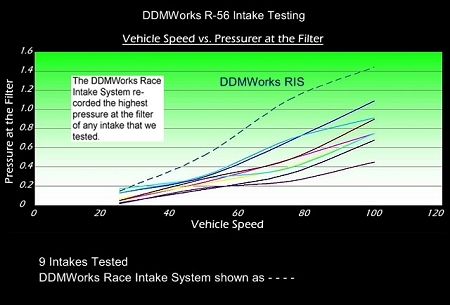 The system comes in two parts, the RAS or Ram Air Scoop which makes use of the non functional hood scoop that was just waiting to be used as an intake source, and the DDMWorks PFB or Pressurized Filter Box. With the complete race system in place, your MINI's filter is washed with cool pressurized ambient air coming in from the front of the car. The whole system working together insures improved throttle response and maximum power consistently for your MINI. . The DDMWorks RAS (Ram Air Scoop) The unique shape of the DDMWorks RAS was designed to accelerate the incoming air from the hood scoop and keep the new intake box under pressure forcing even more cold air into the turbo and engine. Two diverters on the back of the RAS direct the air down into the filter, and the RAS seals with the top of our pressurized filter box (PFB) to ensure a cool ambient air supply. We also wanted regular maintenance of the car to be unaffected with the intake installed, so even with the RAS mounted to the bonnet of the car, regular maintenance of your engine is just as easy as stock. Access to the spark plugs, oil filter and oil fill are just like stock. The scoop attaches to the bonnet using existing mounting points so there is no drilling or modifications needed for installation. The RAS can also be purchased separately for use with other intake systems that leave an exposed filter in the back of the engine bay. We learned during our thousands of miles of testing that exposed filters without the RAS in place see good temperatures during light cruise, but during long pulls the temperature of the incoming air continued to climb as the turbo heated the air coming in through the scoop. With the simple addition of the RAS on those intakes, temperatures stayed only a few degrees above ambient, which resulted in better throttle response and more consistent power. The RAS is offered in black matte powder coat for a stock appearance. Click the button below to add the DDMWorks Mini Cooper S R56 Race Intake System | 2007+ N18 Mini Engine to your wish list.